Commercial real estate marketing has many stages and for the last few years we have primarily been focused on finished asset marketing. Recently, I noticed the gaping hole in commercial real estate marketing opportunities in the pre construction and construction phase. Creating content has become more and more paramount for commercial real estate companies. Pre construction views give everyone from your sales team to your marketing suite powerful content for telling the beginning of your story. 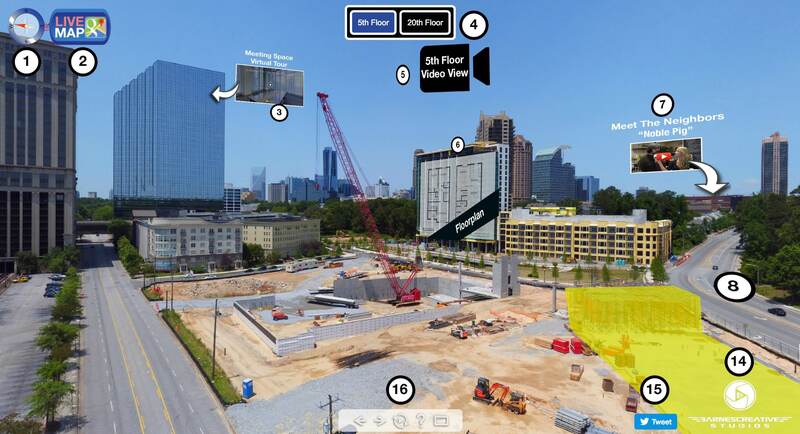 Using pre construction views add instant value and can be designed to show the area you are building in but also the views of each apartment, condo or office space that you are marketing. Here is an example from a new high end condo building coming to Midtown Atlanta called Dowling at The Park. Our latest offering that we’ve created is the “Commercial Real Estate Power Panorama” and it generates fantastic multimedia content for websites, social media, on-site sales, meetings and beyond. Check out another example here where CBRE is pre marketing a state of the art complex coming soon. The commercial real estate power panorama adds context to any marketing plan whether you actually have the asset, yet, or not. For example, you have an empty lot and creating amazing context for the upcoming building by looking outward in all directions from the space. The example below was created with this format in mind. Call out restaurants, locations, and parts of the city that will help you sell your asset. 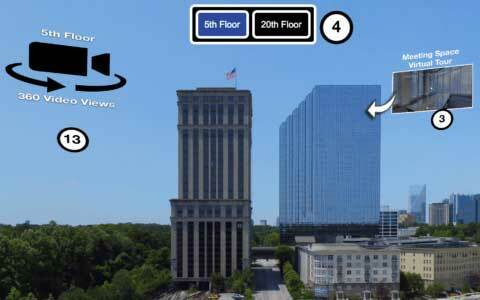 You can also create video views from specific units or a 360 video view of a specific floor…or both. This power panorama application could replace your website in the early stages of construction. The sky is the limit and we have countless production ideas for all budgets, plus you can use your brand colors, fonts and logos to customize the presentation. This same application could also be executed very successfully for a multifamily development or hotel/resort that already exists. The same principals from above are relevant and will supercharge your marketing efforts versus competitors adding contextual value that will yield massive ROI. It’s an electric marketing plan for commercial real estate. Virtual Tour Call Out – Click on the graphic to reveal a Matterport virtual tour (that we offer) of anything from a local attraction to a fancy restaurant. Or you could turn the camera on yourself and point out different floor plans showing the context of where the sit on the property. Video View – In this example click the icon to view the exact live video view from this direction. You could feature views from any direction you wish and also place the icon anywhere in space that you wish. The icon can also be custom made to suit your brand creative standards. Floor Plan View – Link to any floor plan that you want to display. This can be executed as you see it on a building or can simply be a button that will launch the floor plan. Video Content Feature – link to any feature that you want and call out the location inside the power panorama. In this case the example is a video series we created called “Meet The Neighbors” which is branded content that uses popular locations to sell your brand. Polygon Markup – Markup any area and define it. In this example we called out a future gym coming to the location. Link Out Feature – Use an image or text to call out a location and link to any website. In this example we showcase a popular restaurant and link to their menu. Floating Video Feature – Showcase a video anywhere in space…put it where you want anywhere in the power panorama. Image Call Out – Use an image to call out a specific area near or far. This scenario is linked nowhere but used as a location marker. Information Link Out – In this example we call out the MARTA rail service and link to train schedule which could be useful for possible renters. 360 Video View – This is another example of a type of video view you can feature that will show an entire floor’s views in a short amount of time. This icon can be located anywhere in space inside the power panorama. We look forward to helping you dream up an amazing power panorama. Contact us anytime for more info. We can help you with the power panorama and any other media you would like to add as content like drone video, virtual tours and feature video packages.